Dallas Plantation, Maine Vacation real estate for sale - Beautifully Crafted Contemporary Home! Beautifully crafted and beautifully appointed, this striking contemporary is privately sited on 4 wooded acres just a mile from Rangeley Village. Spacious tiled mudroom entry leads to open kitchen/living area with wood stove, cozy 4-season sunroom that brings the outside in. 2 bedrooms on the 2nd floor and full bath with laundry, plus finished basement with large family room, bedroom, full bathroom with jetted tub. 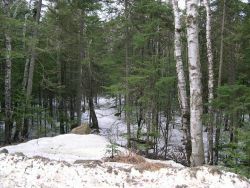 Attached 2 car garage for your stuff, sun filled yard loaded with local wildlife, close to snowmobile trails. Low plantation taxes - don't miss it!